Up against the might of Android Wear and the Apple Watch, the Pebble and Samsung Gear series are the underdogs when it comes to the battle for the smartwatch market. Each has their own advantages though: the Pebble has been selling in the hundreds of thousands for nearly two years, while the Samsung Gear range and its Tizen OS offer comprehensive smartphone connectivity and a pile of on-board features. We've pitted both these platforms against each other to see which one comes out on top. The Pebble range run a mini-OS of their own, controlled through an app on a connected Android or iOS device. It lets you change watch faces and install Pebble apps – everything from games to remote controls to news apps are available. There are somewhere in the region of 3,000-4,000 Pebble apps to choose from. It's not a particularly sophisticated OS, but then that might be just what you're looking for. Check out our guide to the best Pebble apps. Like Pebble OS, the Tizen software that Samsung puts on its Gear line (with the exception of the Android Wear-powered Gear Live) is a miniature platform in its own right. There aren't as many dedicated apps for it, however, and you're going to need a Samsung Galaxy phone running Android 4.3 or above to use it. But, with over 1,000 Tizen smartwatch apps already available and some pretty big partners already playing ball (Endomondo, Nike, PayPal, Deezer, Facebook and lmore) it's certainly not a limited platform. Tizen adopts a touchscreen interface rather than the physical buttons of the Pebble and Pebble Steel. The Pebble watches don't have the same slew of sensors as something like the Apple Watch, but there have been recent changes to make the devices more effective for fitness tracking. It's now possible to monitor steps, activity and sleep using your Pebble, as long as you have the right app installed. Health and fitness is more of an afterthought when it comes to the Pebble but the functionality is there. Samsung, meanwhile, has made a lot of the fitness tracking capabilities built into the Gear series – these devices are essentially fitness tracker/smartwatch hybrids. The integrated pedometer and heart rate monitor in all models in the Gear range communicate with Samsung's S Health app or the third-party app of your choice. The Gear S includes its own GPS sensor too, so it's ideal as a running companion. Almost two years down the line, the Pebble series has a smooth and intuitive notifications system that lets you check what's happening on your phone (though on iOS you can't turn individual app notifications on or off). It's not the most sophisticated system – and options to respond to alerts are limited – but it does the job effectively. On the Samsung side, the Gear Manager app on your smartphone lets you control which app notifications appear on your phone and which don't. Interacting with and dismissing these pop-up alerts is fairly painless and Samsung has done a decent job of syncing notifications between watch and phone, so you can jump straight from a new message alert into the email client on your smartphone. Pebble knows the fight for supremacy of the wrist is going to be a tough one and has been busy cutting prices across the board. The original Pebble can be picked up for £99 / $99 while the premium Pebble Steel can be had for £179 / $199. Even taking the monochrome, non-touchscreen display into account those are competitive prices. Samsung starts its prices where the Pebble finishes: the Gear 2 Neo comes in at £169 / $199, putting it just about on a par with the Pebble Steel. The flagship Gear 2 (with its premium appearance and camera) can be yours for £250 / $299, while the SIM-supporting Gear S is set to be even more expensive at £329 (although the price is yet to be officially confirmed). You can do more with Samsung Gear, like make and receive phone calls and take photos, and the full-colour touchscreen display comes across as more stylish and modern than the one sported by the Pebble. The Pebble watches, on the other hand, are cheaper and offer more apps – and they work with almost any smartphone running Android or iOS. If you've already invested in some Samsung gadgetry then it makes sense to use the smartwatch platform that's going to offer the best compatibility. For everyone else, the Pebble or the Pebble Steel makes most sense right now. It doesn't have quite as many bells and whistles, but when it comes to a smartwatch, simple is often best. 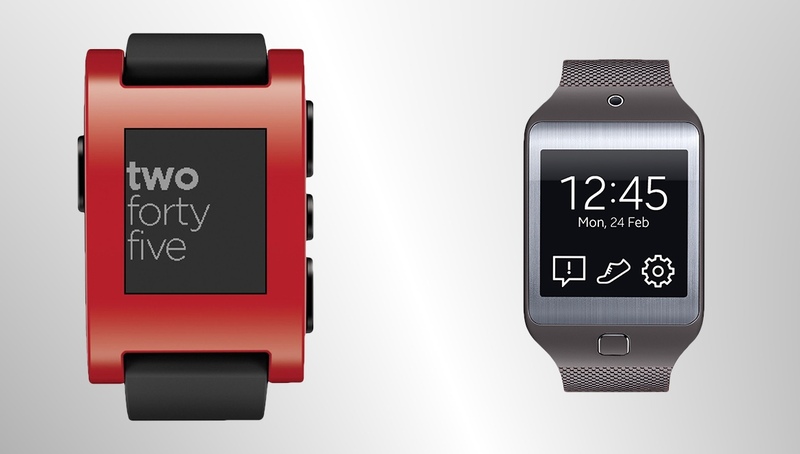 The battery life benefits too: a Pebble will last 5-7 days on a single charge compared with 2-3 days for the Gear 2 Neo. Be sure to also check out our opinion of the best smartwatch you can buy and the best budget smartwatch available too.